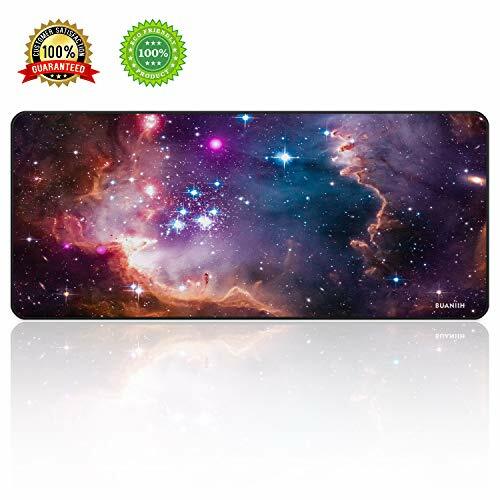 Color:Galaxy Color:Galaxy BUANIIH the coolest gaming mouse pad,give you comfortable feeling and stimulating experience,your best partner whether it is game or work. Designed for gamers,great use for gaming and office work. Anti-slip rubber base optimized for various mouse sensors and sensitivities. Low friction and smooth surface with stitched frame to keep quickly moved and accurately positioned. Washable and foldable let your enjoy smart life anywhere and anytime. Best keyboard mice mat mousepad gift for men,women,children,teens,friends,family and others,don't hesitate,buy it now!